Rich people can afford to eat whatever the heck they want. This can be considered an advantage. Okay, it is an advantage, but it also results in a lot of weird stuff being considered as food - and a lot of weird stuff costing a lot of money. It's been said that, as long as something can be considered "posh" and given a convincingly wild backstory (or its rarity can be stressed), there's somebody out there that will pay through the nose for it. Everything from hamburgers to chocolate has a hyper-expensive version. No, they're not all found in Dubai. Well, you could probably buy some of this stuff in Dubai, but for the most part, it's all over the world. In New York, you can get thousand-dollar Lobster Bisque. In the United Kingdom, there's at least one restaurant that sells Wagyu beef - you know, that super-rare Japanese beef where the cattle get massages and enjoy beer to keep them tender. There are places all over the world that sell something that costs more than what some of us make in a year. Exaggeration? Maybe a little. Whether the ingredients only sprout under a full moon in August or the species that makes something in the meal is down to 500 members in the wild, or it's a food item that's diamond-studded and sprinkled with 23-karat gold, there's some wild, wild stuff out there. Journey with me as I show off 20 of the world's most expensive foods and meals, and where you can get them. Hey, if you can afford to buy some of this stuff, do you mind maybe giving me a sample? Especially the chocolate. 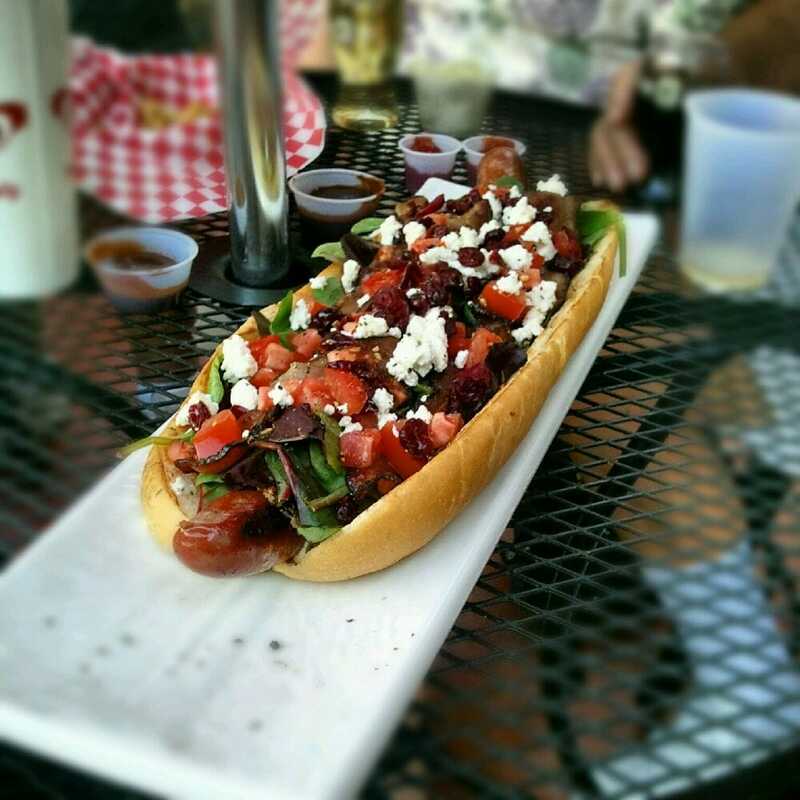 Capitol Dawg in Sacramento is the home of this 3/4 pound all-beef wiener that you'd have to have a lot of disposable income to try (not compared to some of the other items on this list, true). It's topped with French mustard, sauteed shallots, baby greens, garlic & herb mayo, applewood smoked bacon, pepper, a basil olive oil & cranberry-pear-coconut balsamic vinaigrette, dried cranberries, and $200-per-pound Swedish moose cheese. Moose cheese. I didn't know this was something that people were brave enough to actually bother making. All of this is piled on a white truffle butter-toasted herb focaccia roll. I'm still stuck on moose cheese. Imagine being the kid that gets this ham for their ham sandwich. If you purchase a 15 pound ham, it'll set you back $2,682 - but why? The pigs are only fed acorns and roots (remember: feed makes a difference in meat quality and flavor), and the ham spends three years curing before it's packaged in its homemade wooden box. As a bonus, each ham comes with a tailor-made apron and a DNA certificate. You know, in case you doubted that you were actually getting the pig you paid for. A restaurant called Kai Mayfair in London sells a specialty soup that contains Japanese flower mushrooms, sea cucumber, huan ham, chicken, dried scallops, abalone, shark fin, ginseng, and pork. Don't expect to be able to get it when you walk in the door unless you ordered it five days before your visit, however, as it takes a while to get some of the ingredients. I somehow wouldn't be surprised if the chef wrestled the shark themselves. Speaking of Iberico ham, here's a sandwich out of the Cliveden House Hotel that actually uses it. Head to London if you want to give this one-pound monster a bite. Iberico ham, quail eggs, poulet de Bresse, semi-dried Italian tomatoes, and white truffles grace sourdough bread, but no ordinary sourdough. How about being fermented for 24 hours? Meals at the Cliveden House Hotel are fairly expensive as a general rule, but not quite to the level of this sandwich. A very common dish in Japan, fugu is more commonly known as puffer fish to Americans. The fish has to be prepared very carefully because it's poisonous, and improper preparation can actually kill the would-be diner. Chefs get special training if they intend to prepare fugu. If you find a restaurant where their puffer fish isn't very expensive, you'll want to skip it - either you aren't getting puffer fish, or you're putting your life on the line in ways you may not have known before now. At $275.00 per single ounce and upwards of $2,000 per pound, white truffles out of Northern Italy are something that most regular people simply cannot get their hands on. With a scent similar to an especially raunchy locker room, these truffles get shaved onto everything from pasta to potatoes and are only available during autumn months, as they're harvested in October. Due to global warming and insecticides creeping into their native soils, though, the truffle harvest has been gradually dwindling over the years, so it's only a matter of time before this delicacy is a thing of the past. Okay, I'm sure this is to somebody's taste, but it's making my stomach churn. When you order this from Norma's in New York, you get 10 oz of sevurga caviar ($65 per oz for the restaurant) on top of a pound of lobster. The frittata itself is simple, just six eggs, cream, and chives. Nearly 3/4 of the price of this dish is to cover the caviar! At least there's lots of lobster. It's not the most impressive dish on the list, but it's still pretty pricey. For just $125 per slice, you can sample the creation of Nino's Bellissima in Manhattan, a multi-caviar-topped pizza that has to be ordered 24 hours before it's actually needed. This pizza's ingredients include lobster, creme fraiche, and chives on a thin crust, and it's a 12-inch pie. Just how many different caviars are on this dish? Six of them. Some have to be ordered in, which just adds to the cost of the pizza. This is the perfect meal for somebody that really loves caviar and can't get enough lobster. Available at two Serendipity 3 locations, New York and Las Vegas, this $1,000 dessert must be reserved at least 48 hours in advance and contains the rarest sweets in the world. The story behind the Golden Opulence is that it was first introduced to celebrate Serendipity 3's 50th year in New York. It's two scoops of Tahitian vanilla bean ice cream given more vanilla flavor with a Madagascar vanilla infusion, then covered with the required 23-karat gold leaf. This sundae's chocolate syrup is made out of Amedei Porcelana chocolate - one of the world's most expensive. The dish is also covered with Parisian candied fruits, chunks of Venezuelan Chuao chocolate, chocolate truffles, even more gold leaves, golden almonds, and marzipan cherries. It's served with a little bowl of salt-free caviar that's been given its own infusion of passion fruit, Armagnac and orange. If you wanted to know what a dessert caviar might be like, there's your chance. Located in London, England, 'Honky Tonk' is an American-style restaurant and bar that naturally specializes in American food. There's little that's more American than a burger, so in 2014, the diner's chef put together the most expensive burger that he could. This 280 gram Kobe Wagyu beef and New Zealand lamb burger was seasoned with Himalayan salt, infused with black truffle brie, and topped with saffron-poached Lobster, streaky bacon (with maple syrup), beluga caviar, and gold leaf-covered hickory smoked duck egg. A Japanese matcha and cream mayo added further flavor, and more gold leaf coated the bun. If you happened to be a burger dipper, well, this beast was also served with a champagne and mango jus. Yes, there was also grated white truffle. The Glamburger doesn't have a place on Honky Tonk's menu, but if you're interested in seeing what it was like, you can always order the mini Glamburger for $24.99. It's 8 ounces of brie-and-truffle-oil-infused, maple-bacon-and-golden-egg-topped burger heaven. Yes, the mini has gold leaf, too. Margo's Pizzeria in Malta tops this pizza pie with white truffles and gold leaf, but you can feel really good knowing that all the money made on this pizza - which has to be ordered a week in advance - is donated to charity. The restaurant received enough exposure from making the pizza that they're able to make back the money that they've spent on it. Hailing from Las Vegas, Nevada, and Fleur by Hubert Keller, this burger is a pretty effective demonstration of the wild and wooly sort of thing the city is known for. It's a fairly simple Wagyu beef burger that's served with a bottle of 1995 Chateau Petrus and topped with some truffles and foie gras. For such a pricey meal, you'd expect a little more oomph out of it, but that's what they're offering. These rare black watermelons are from the Hokkaido region of Japan, and have sold at auction (usually the first harvest of the year) for anywhere from $3,000-$6,000. You can get them cheaper at Loblaws in Toronto - or you could as of August 2014 - for $200. That's in Canadian funds, by the way, so if you're an American wanting to get your hands on one, you should do it while the Canadian dollar is so cheap. Another food item that was created for milestone purposes is the Posh Pie out of The Lord Dudley Hotel in Sydney, Australia. This is the priciest surf-and-turf meal ever, full of premium beef, Australian rock lobster, and Winter Black truffles. The real kicker? It also comes with a couple bottles of Penfolds Grange Reserve. In case you thought you might be able to get away with something not having gold leaf, you're wrong - this pie has some, too. Pizza by Renato Viola is already a big deal. The master pizza chef designed this particular two-person pie for at-home serving, and for a very select clientele. A catering team prepares the dish and serves it on limited edition dishes and cutlery. Oh, and the dough is prepared 72 hours in advance. The pizza's ingredient list is pretty fantastic: Australian pink salt, three types of champagne-soaked black caviar, organic buffalo mozzarella cheese, Norwegian lobster that's been marinated in cognac, Mediterranean prawns, and Cilento bugs. It's served with the highest-quality cognac available, Remy Martin Louis XIII. You could also buy me a used Corolla for that much, if you were that desperate to blow twelve grand. This strangely-named dessert is from Sri Lanka, and can only be found at The Fortress' Wine³ restaurant. It's described as "a gold leaf Italian cassata", which is a traditional round sponge cake. This particular cake is flavored with Irish cream that's been infused with fruit. A mango and pomegranate compote with a Dom Perignon champagne sabayon make up the base of this dessert, and the decorations that accompany this thing are handmade chocolate carvings of stilt fishermen, which are common to the area. Oh, and this dish is decorated with an 80 carat Aquamarine stone. The world's fanciest steak and mushroom pie is stuffed with Wagyu beef (about $1,000 worth), matsutake mushrooms, black truffles, gold leaf, and $8,400 in 1982 Chateau Mouton Rothschild red wine, which is only two bottles. This pie is served with champagne and can feed 8 people. The chef at the Fence Gate Inn in Lancashire claims this dish, and also claims that this version of the traditional steak and mushroom pie is much better and totally worth the cost. How's this for decadent? Chocolate ice cream made up of a blend of 28 cocoas, decorated with edible gold, served in a goblet that has even more edible gold lining the bottom. Oh, and 14 of those cocoas are among the most expensive. If you like getting a prize with your dessert, this one has an 18 karat gold bracelet in the bottom, and that bracelet has 1 carat of diamonds embedded in it. Still not enough? Okay. You get to take home the gold spoon you'll be eating that sundae with, which also has diamonds in it. Ta-freaking-da! Buy it at Serendipity 3 in New York City. This isn't any ordinary caviar. Harvested from rare albino beluga sturgeon, 'Almas' is an almost pearl white in color and possesses a spongy texture. The fish that this roe is harvested from are between 60 and 100 years old, and can weigh upwards of 2,000 lbs. They're about as heavy as a Volkswagen Beetle, so it's no wonder that it costs $34,500 for just two pounds of this stuff. It's usually sold in a gold container, and it's easiest to procure in Iran since the country's fisheries are in the good books of the Convention on International Trade in Endangered Species. For just $34,500 you could get your hands on a very fancy chocolate pudding created by Marc Guibert, the head chef of the Lindeth Howe Country House Hotel. You'd have to travel all the way to Windermere, Cumbria, to get a taste, however. Made of four varieties of Belgian chocolate and flavored with peach, orange and whiskey, it also includes the requisite edible gold leaf and some champagne caviar. There is an inedible diamond on top of this dessert, and is served with highly-expensive Chateau d'Yquem dessert wine. The pudding is served in an edible Fabergé egg. So, not only are you getting the best of the world of chocolate, you're also enjoying an absolute masterpiece of baking.